We just started homeschooling this year for our 6 year old. We decided to go with My Father’s World 1st grade for our curriculum. It is a Charlotte Mason method curriculum, meaning more laid back, learning through reading, etc. I can’t say that I’d recommend this curriculum, at least for 1st grade. It is not academically rigorous. Some families are happy with that, wanting their kids to relax and enjoy their childhood and early schooling experience. We were kind of bored and disappointed with it. There’s no spelling included with it, no set math, unless you buy the suggested Complete Book of Math workbook for $14, which we did. However, it’s just a workbook that you could buy at Wal-Mart or any teacher store. They suggest what math concepts your child should learn in first grade, and make some suggestions for games, but don’t give you anything concrete or physical to use to do so. There are Bible stories included in the parent manual, but no pictures to go along with it. If you have an auditory learner, this might work for you, but my daughter is very visual and hands on. I have to think that most 1st graders are like that. In the back of the parent manual, they give you a list of books to get from the library to help teach math concepts, science, and the like. We have to get them ordered from our library, so we are there at least twice a week. Many of the books so far are way too childish for her. A few of the math books were talking about the concept of counting to 10. She’s in first grade! Some of the books were cute, but the level seemed too immature or not challenging enough for a 6-year old. On the other hand, they suggest getting the book, “Honey for a Child’s Heart.” This is a book where someone has identified classic books for kids by age that have either a Christian theme or teach good character. This is a worthwhile book. I have to say about 90% of the books we have gotten from this book’s lists have been very good and age appropriate. I plan on trying to read to her most of the books listed. If you have an older child (3rd grade on up) and they like computers, there are two online programs out there that I have heard of. Switched On Schoolhouse is one of them (http://www.aophomeschooling.com/). Kids like the games. The other is Ambleside Online (http://www.amblesideonline.com/). Since we got frustrated with MFW, I was forced to look for something else to keep my daughter’s attention. Someone suggested looking into Sue Patrick’s Workbox System. This has been a life saver. Not just the system itself, but the whole world of free printables online that I never knew existed! You could literally easily create your own curriculum for free, that is tailored to your child’s interest and academic level. The only requirement is time, a good printer, and a laminator. 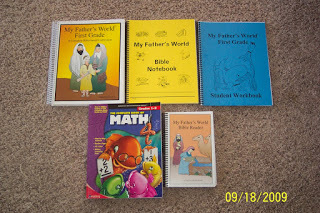 Since we’ve started the workbox system (just last week), I have had no need for our My Father’s World curriculum, but do plan on trying to glean some from it. My daughter has difficulty writing a lot, so I have to incorporate a lot of hands on learning. MFW 1st is a lot of reading and writing, with some activities involved, but I found there was too much work involved for the parent for the crafts and I didn’t feel what they learned from the craft was really all that much. More of a time killer. I’d rather print something out than have to search for materials and try to create something. I’ve heard that 2nd grade on in My Father’s World is better, and I can’t say that we’ll never use MFW again, but I would not use Kindergarten or 1st grade. I have heard some of the same comments I have made from other parents as well. I know there’s a point to not pushing your kids too far too fast, but if your child is ready, there’s no reason to stall their learning because the curriculum isn’t challenging enough. That’s the whole point of homeschooling. You don’t have to wait for the entire class to get it before you can move on. That is just our experience with MFW. I know some families really like it, but every child is a different learner, and this didn’t work for us. I plan on trying the curriculum from Sonlight and see if we like that better. We do have Hooked On Phonics that we bought a few years ago on E-Bay (new). This worked great for my older son. He learned to read proficiently by the end of Kindergarten. By the beginning of 1st grade, he was reading Magic Treehouse chapter books. It took him not quite a year to get through the HOP workbooks. My daughter likes it as well. It breaks reading down into chunks and makes them successful at it, so they are eager to do more. It really leaves no room for failure at reading. She reads 2-3 pages from the workbooks every night. MUCH, much better than how they are taught reading in the public schools. If I left it up to the schools, my kids would be terrible readers.